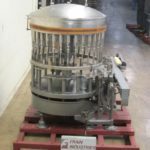 In addition to stocking a variety of vacuum liquid fillers, Frain provides the engineering expertise, technicians on staff, and parts to ensure your vacuum liquid filler project gets off to the right start, fast, and continues to run. Vacuum Overflow Liquid Fillers – Designed to pull vacuum and return product to the overflow once the desired level is reached. Vacuum filling machines are primarily used to fill glass bottles with free-flowing to medium viscosity liquids. Vacuum overflow fillers are ideal for filling caustic or foamy liquids, but can be used for a variety of applications, including cologne, cosmetic products, and more. 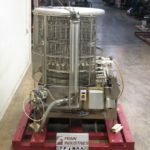 Contact Frain today to discuss our inventory of used vacuum liquid fillers and your specific needs with one of our highly experience engineers. Semi-automatic U S Bottlers vacuum filler with four (11/16") drip less sleeve fill nozzles. Expandable to 9 spouts. 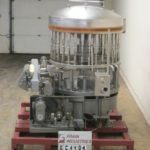 Specifications- Liquid, Glass, Rotary, Heads 12, : Mod HBV (Flofil) rated from 20 to 120 bpm (Type 3.0) diameter thru a 7/8" dia screen flo-filling valve, and has max dia range: round up to 6 1/4", and rectangles to 5 15/16". Set on 7 1/2" centers w/1/2" nozzles. All s/s contact parts, and overhead product inflow/level control sys, 90" L x 1 3/4" W product conveyor, worm screw to star wheel infeed & discharge. 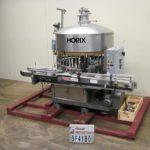 Horix Model HAV40 automatic, 40 head, rotary, vacuum filler rated from 50 to 360 containers per minute on 200ml fills 25 to 280 on 750ml fills. Maximum container diameter size: 3-3/8" round and 3-1/8" rectangle containers and up to 12" High with Fills to 750ml. Equipped with 48" diameter table has (40) 9/16" OD nozzles set on 5" centers with 4-1/2" long x 4-1/2" wide rising container pedestals, 120" long x 3" wide product conveyor with worm screw to star wheel in feed and discharge. 304 stainless steel contact parts, overhead rotary valve product feed system, bottom up fill, no container / no fill and CIP ring. Control panel with touch pad controllers, with on/off and e-stop, interlock plastic guarding and mounted on painted base frame. Automatic, intermittent motion, inline, vacuum filler fill range and speeds – dependant on materials and application. Equipped with 28" long adjustable nozzle filling bar currently set-up with 11 filling heads on 2" centers with 1" OD nozzles with a maximum container height of 7" high. 20" long x 10" wide x 10" deep product supply tank and is capable of handling glass, metal, or any rigid cotainers. 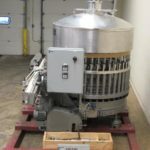 U S Bottlers Model VA32 automatic 50 head, rotary, vacuum filler rated from 50 to 320 container per minute – depending on materials and application. Container size range: 1" to 3-1/4" in Diameter x 4-1/4" to 12" in Height. Equipped with 32 filling heads, 1/2" OD and 1/4" ID nozzles set on 4" centers with 56" long x 2-1/2" wide product conveyor with worm screw to star wheel in feed and discharge, overhead product feed system with overflow, bottom up fill, no container / no fill vacuum system with diaphram pump, safety guarding and mounted on 4 leg base frame. Automatic, intermittent motion, inline, vacuum filler with speeds dependant on materials and application. Equipped with a fifteen gallon stainless steel supply tank, 140" long x 2" wide product conveyor, 11" maximum container height, product eye sensor, sixteen filling heads, 3/8" filling nozzles, starwheel feed to discharge, and variable controls. Mounted on locking casters. Currently set up for a 4" high x 2" diameter container. 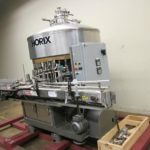 Horix automatic, 32 head, rotary, gravity vacuum filler rated from 50 to 270 containers per minute on 500ml fills. Maximum container diameter size: 4-1/8" round and 4-1/16" rectangle containers and up to 12" High with Fills to 500ml. 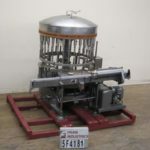 Equipped with 48" diameter table has (32) 5/8" OD nozzles set on 5" centers with 9-1/2" long x 9-1/2" wide rising container pedestals, 79" long x 3-1/2" wide product conveyor with worm screw to star wheel in feed and discharge. 304 stainless steel contact parts, overhead rotary valve product feed system, bottom up fill, no container / no fill and CIP ring and mounted on painted base frame. 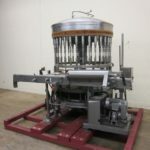 JG Model Minivac 12, compact, automatic, 12 head, stainless steel, rotary vacuum filller rated from 40 to 120 containers per minute – depending on materials and application. Equipped with (12) 1/8" diameter nozzles set on 3" centers, can handle containers up to 2-1/2" in Diameter and 4" in Height, Kerr vacuum pump, automatic vacuum overflow, with push botton start / stop controls for vacuum, turn table, filler and e-stop. 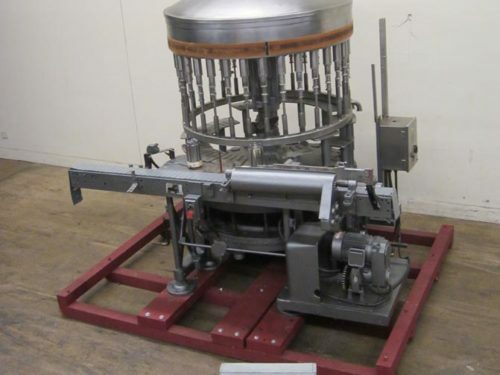 MRM Elgin, Model R-50, automatic 12 head rotary vacuum filler. Used to fill oxygen sensitive products. Rated from 40 to 120 containers per minute – depending on materials and application. Currentley set on 8" centers and has a container size range from fractional ounces to 1 gallon – depending on materials and application (with proper change parts). Equipped with a 135" long x 4½" wide container conveyor, 40" OD turntable with (12) 12¾mm OD / 3mm ID stainless steel vacuum nozzles, 1 HP vacuum pump and bottom well product feed system. Push button start/stop for filler, vacuum pump and conveyor with variable speed controller and mounted on mild steel base frame. MRM, automatic, 20 head, rotary, vacuum filler rated from 40 to 180 containers per minute – depending on materials and application. Currentley set on 5" centers and has a container size range of: up to 4-1/2" in Diameter x up to 9-1/2" in height. Equipped with 40" long x 3-1/2" wide container conveyor, 36" OD turntable with (20) 1/2" OD stainless steel nozzles.with all stainless steel contact parts, overhead product feed system, bottom up fill, no container / no fill. Remote control panel with filler, vacuum pump, conveyor, controls dials with start / e-stop buttons, vari speed controller and mounted on (4) leg base frame. 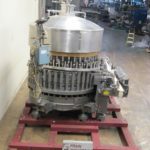 U S Bottlers Model VE40L automatic 40 head, rotary, vacuum filler rated from 40 to 340 containers per minute – depending on materials and application. Container size range: 1" to 4-3/4" in Diameter x 4-1/2" to 12" in Height. Equipped with with 48" long x 2-1/2" wide product conveyor, worm screw to star wheel in feed and discharge, 72" turrett has 40 filling heads and 5/8" OD nozzles set on 5" centers overhead product feed system with overflow, bottom up fill, no container / no fill. Control panel with product volume, machine clean on / off switches, jog, manual vacuum start and e-stop push button controls. Mounted on heavy duty base frame. 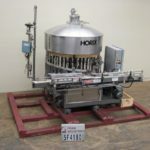 U S Bottlers Model VE36L, automatic 36 head, rotary, vacuum filler rated from 40 to 300 containers per minute – depending on materials and application Container size range: 1" to 5-1/4" in Diameter x 4-1/2" to 12" in Height. Equipped with 48" long x 2-1/2" wide product conveyor, with star wheel in feed and discharge,72" turret has 36 filling heads, with 1/2" OD nozzles set on 6" centers, overhead product feed system with overflow, bottom up fill, no container / no fill. Control panel with auto, manual start and e-stop push button controls. Mounted on heavy duty base frame.